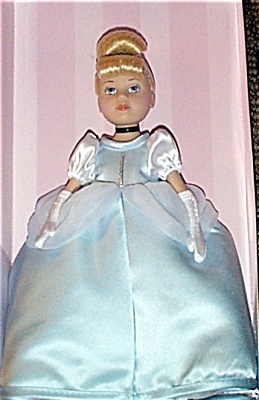 Madame Alexander 9 inch vinyl 2003 Cinderella in blue ball gown from Disney version of this fairy tale. She has rooted blonde hair styled in a bun with blue ribbon, and blue painted eyes. She is wearing a classic Disney princess costume of a long blue satin-like ball gown with white sleeves, white gloves, black ribbon at her neck, and blue shoes. She is comes in a pink window box with the Disney Princess logo, while her well-made costume has an Alexander Doll Company label inside. Old Stock doll is near mint-in-the-box, but box may show wear or small dent or tear, which is why this is listed as used. Expand listing to view both the photograph and the catalog picture.